Celebrating the topping out at Blacktown Hospital’s new car park. 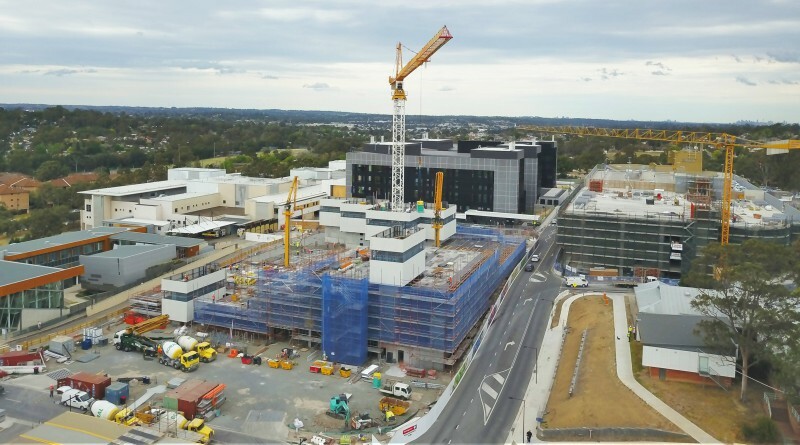 Blacktown Hospital has reached a major milestone in the construction of its car park – the first in NSW with high-tech parking guidance system – under the $700 million expansion. Minister for Health Brad Hazzard today attended the last pour of concrete at a topping-out ceremony, held on the roof of the five-storey, 414-space car park. The Blacktown Hospital car park will have a high-tech guidance system. “The one million plus people who attend Blacktown Hospital every year will find parking a lot easier when the new car park opens in early 2018, bumping the number of available car spaces across the campus up to 1500,” Mr Hazzard said. The Blacktown Hospital car park is the state’s first to include parking navigation technology with red and green lights to help drivers find the nearest available space, similar to major shopping centres. Car park users will also benefit from the NSW Health Hospark app that helps visitors find parking information and directions to public hospitals across NSW. The NSW Government is investing more than $700 million in the Blacktown Mount Druitt Hospital redevelopment. The redevelopment is expected to deliver more than 7000 jobs and is part of a $7.7 billion building boom in health services across the state. The centrepiece of Stage 2 at Blacktown Hospital, the new Acute Services Building, will include a bigger emergency department with a new dedicated psychiatric emergency care centre, an expanded intensive care unit, a new paediatric service, eight new operating theatres and expanded birthing, maternity and newborn care services. The Blacktown Mount Druitt Hospital Redevelopment includes extensions at Mount Druitt Hospital to provide expanded facilities for surgery and imaging, and new facilities for community dialysis and addiction medicine. The car park is due to open in early 2018; the new acute services building is due for completion in 2019 and Stage 2 of Blacktown Hospital is due for completion in 2020. For more information please visit: www.bmdhproject.health.nsw.gov.au. Taylors crane operator Charles Edmonds moving a tree that was donated to mark the topping out at Blacktown Hospital’s new car park.